Going on a heavy veggie lifestyle change has created a need for creative carb alternative food. In my previous posts, I explained how much I loved bread products, and with this recipe, you can hardly tell its free from wheat & gluten! It’s also a wonderful way to hide extra veggies in your kids’ and husbands’ food. 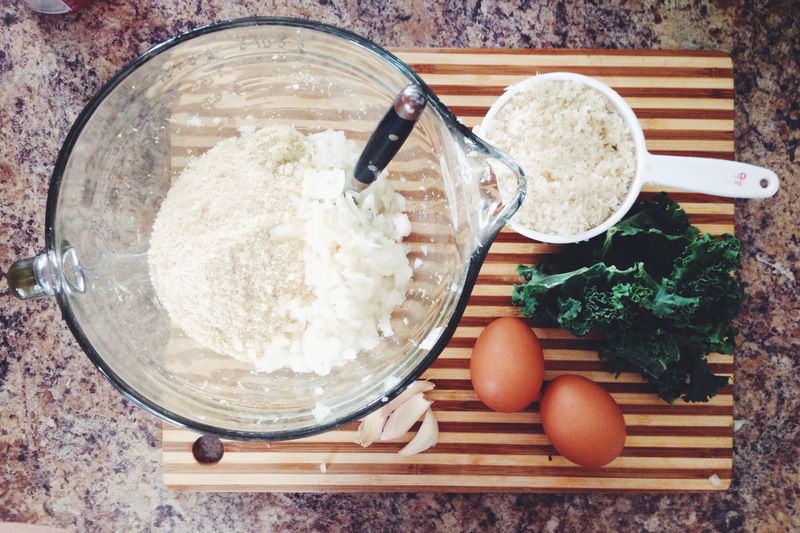 😉 My boyfriend can’t stand the taste of kale, and its the only way I’ve found to get him to eat this superfood. 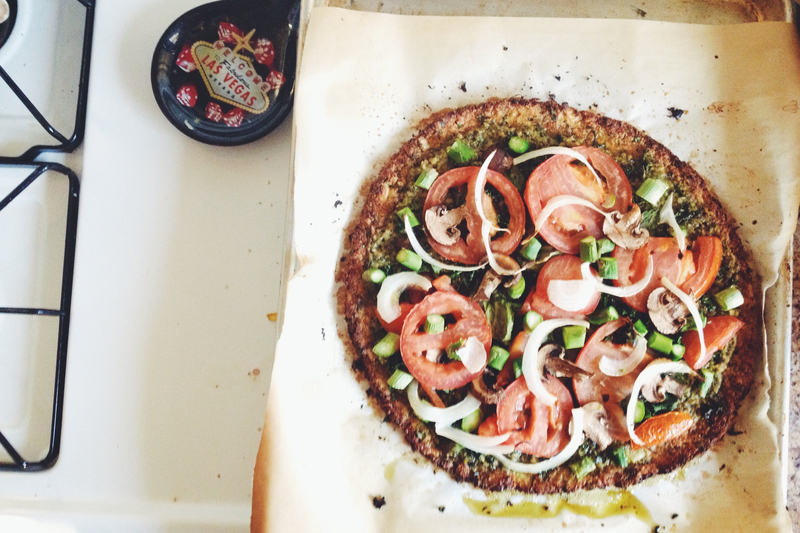 I’d experimented with many cauliflower crust recipes, and while they all tasted great, they could never stand up to the “hold test”, no matter how long I cooked it for. My toppings were always falling off and I never had the same satisfaction eating pizza with a fork… This recipe blends 3 ingredients in the crust, resulting in a pizza you can grab with one hand without the toppings falling off. 1. Microwave cauliflower for 5 minutes. Let cool. Strain using cheesecloth or thin dish towel. The more water you can release, the better. 3. Roll mixture into a ball and place on parchment paper lined baking sheet. 5. Brush olive oil on perimeter area, if desired. 6. Bake dough for 15-20 minutes @ 450 degrees F.
7. Add desired toppings & bake for 10-15 more minutes. This just depends on toppings used, and how well done you like your veggies and crust. The toppings on this pizza include (more) kale, asparagus, tomatoes, onions, and mushrooms. 8. Let cool & enjoy! * I love using pesto instead of pizza sauce because there is no sugar and I find that it somehow has the taste of cheese. I opt to not include cheese on my pizzas at all, to keep the recipe dairy free. * I also recommend always using organic, non-GMO ingredients whenever possible. Let me know what you think and what toppings you like to include on your pizzas! This looks really good! I like the pesto idea. I’m going to try this with sorghum flour, with spinach and mushrooms for toppings. Sweet! I have never used sorghum flour…how does it differ? Been looking for ways to make things more “doughy”…does it do the trick? !